Choose these eco-friendly large noodle containers for a twist on the classic take out look. Each of the 200 containers in a pack hold 16 oz of noodles in their 3.6 inch by 3 inch by 3.3 inch high dimensions. These kraft colored paper containers are eco-friendly, so you can be confident the materials you are using are environmentally friendly. 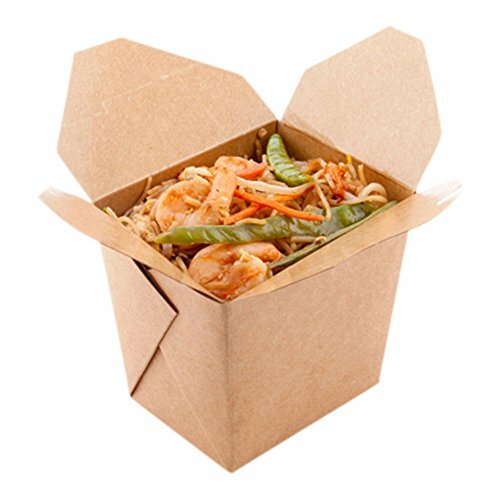 ENVIRONMENTAL-FRIENDLY TAKEOUT CONTAINERS: These medium ENVIRONMENTAL-FRIENDLY Bio Noodle Takeout Containers are perfect for holding a variety of meals such delicious rice, noodles or salad. SIZED RIGHT: These microwave-safe paper containers are 3.6" x 3.0" x 3.3" in size - perfect for taking up to 16-OZ of your favorite foods with you on the go. ENSURE A STEADY SUPPLY" With 200 of these disposable paper food containers in one package, you won't have to worry about running out anytime soon. MADE FOR RECYCLING: Constructed with 100% paper, these Asian-inspired Chinese food boxes can be recycled in a snap but still perfectly hold their shape while in use.